le chaudron de vulcain – May 17 , 2018. EN. Pu’u ‘Ō’ō / Kilauea , Sinabung , Ticsani , Piton de la Fournaise , Cleveland . Home / Alaska / May 17 , 2018. EN. Pu’u ‘Ō’ō / Kilauea , Sinabung , Ticsani , Piton de la Fournaise , Cleveland . There is no geologic evidence for past catastrophic collapses of Kīlauea Volcano that would lead to a major Pacific tsunami, and such an event is extremely unlikely in the future based on monitoring of surface deformation. 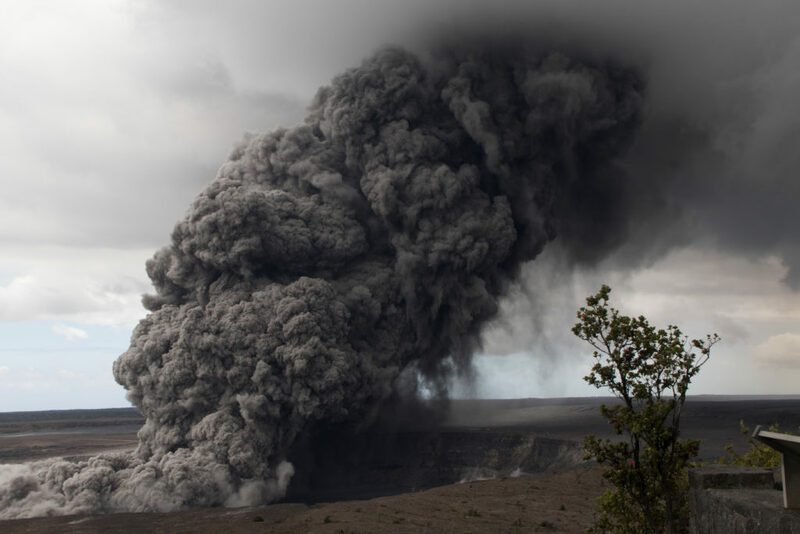 Kīlauea tends to « slump », which is a slower type of movement that is not associated with tsunamis, although localized tsunamis only affecting the island have been generated by strong earthquakes in the past. Cross-section through the lower East Rift Zone of Kīlauea Volcano. Magma intruded into the rift zone and exerted pressure on the south flank of Kīlauea, likely encouraging the M6.9 earthquake that occurred on a fault located at the interface between the volcano and the preexisting ocean floor. 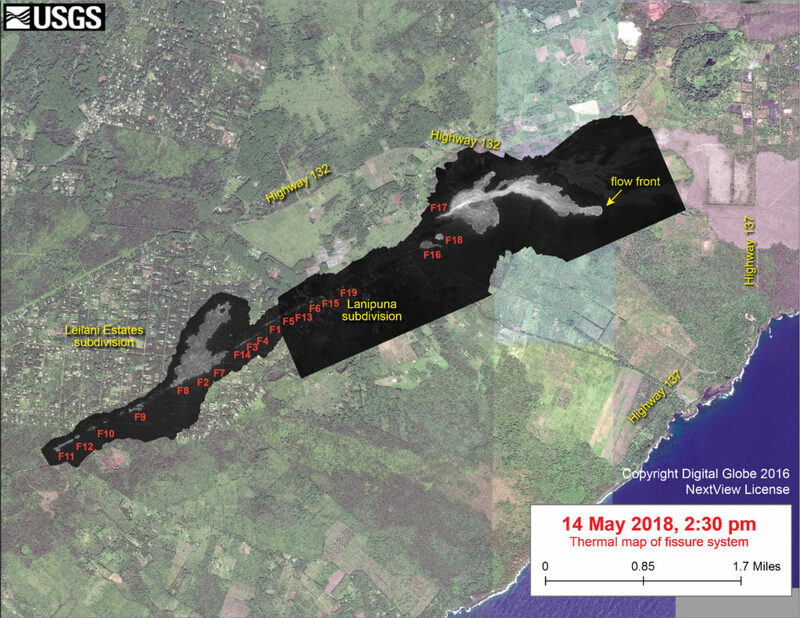 This thermal map shows the fissure system during an overflight of the area this afternoon (the western part of the thermal map, in Leilani Estates, was based on a May 9 overflight, and fissure activity in that region has not changed since that time). Fissure 17 was producing a lava flow extending about 1.7 km (1.1 miles) from the fissure. The black and white area is the extent of the thermal map. Temperature in the thermal image is displayed as gray-scale values, with the brightest pixels indicating the hottest areas. The thermal map was constructed by stitching many overlapping oblique thermal images collected by a handheld thermal camera during a helicopter overflight of the flow field. The base is a copyrighted color satellite image (used with permission) provided by Digital Globe. Hawaiian Volcano Observatory reports a new fissure has opened in the Lanipuna Gardens Subdivision northeast from fissure 19. 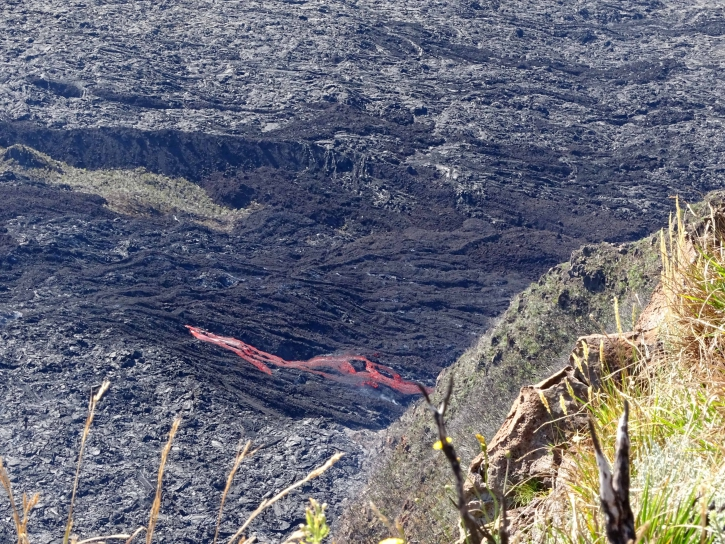 The narrow lava flow from fissure 17 is still moving slowly toward the ocean at approximately 20 yards per hour. There are no homes or roads threatened at this time. Ash emission from the Overlook crater within Halemaumau has generally increased this morning compared to previous days. Although varying in intensity, at times the plume contains enough ash to be gray in color. The cloud is rising an estimated 3 to 4,000 feet above the ground, but altitudes are varying with pulses of emission. The ash cloud is drifting generally west and southwest from the Kilauea summit and ashfall is occurring in the Ka’u Desert. Communities downwind are likely to receive ashfall today and should take necessary precautions. (Tim Bryan) This was shot from Highway 11 toward Pahala at about the 31 mile marker. This morning, eruptive activity remained concentrated at fissure 17, with intermittent lava spattering at fissure 18. Earlier this morning, a new fissure (20) located near fissure 18 produced two small pads of lava. The ‘a’ā flow spreading from fissure 17 advanced about 380 m (1,250 ft) since 2:30 p.m. HST yesterday. The advance of the flow has slowed significantly since yesterday afternoon. At 6:45 a.m. the flow was nearly 2.5 km (1.5 mi) in length. At 1:38 p.m. HST, another dark ash plume rose from the Overlook crater. During a flight earlier today by the Civil Air Patrol, the height of the ash plumes near the crater rose to more than 3 km (9,800 ft) above sea level, and downwind the plumes continued to rise to about 3.5 km (11,500 ft) above sea level. 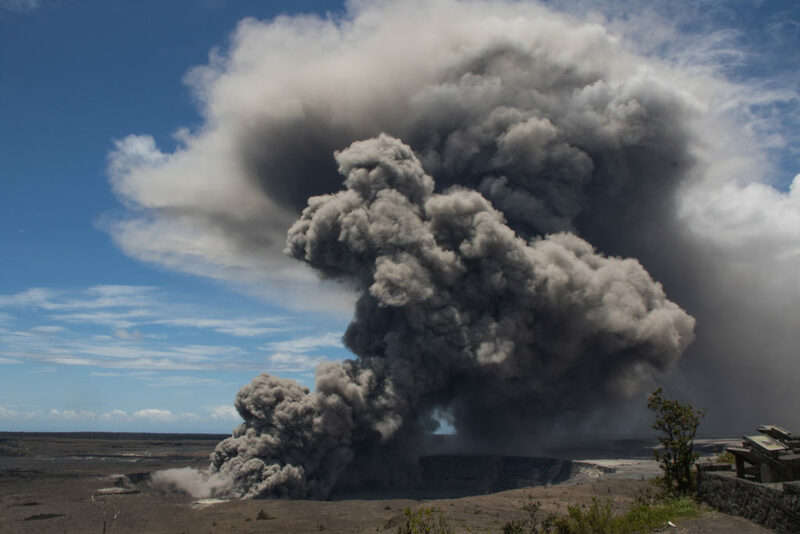 As of early this morning, eruption of ash from the Overlook vent within Halemaumau crater at Kilauea Volcano’s summit has generally increased in intensity. Ash has been rising nearly continuously from the vent and drifting downwind to the southwest. Ashfall and vog (volcanic air pollution) has been reported in Pahala, about 18 miles downwind. NWS radar and pilot reports indicate the top of the ash cloud is as high as 10,000 to 12,000 feet above sea level, but this may be expected to vary depending on the vigor of activity and wind conditions. At 11:05 a.m. HST. Photograph from the Jaggar Museum, Hawai`i Volcanoes National Park, captures an ash plume rising from the Overlook crater. Ash falling from the plume can be seen just to the right side (and below) the plume. The volcano was cloudy, Crater smoke is not observed. 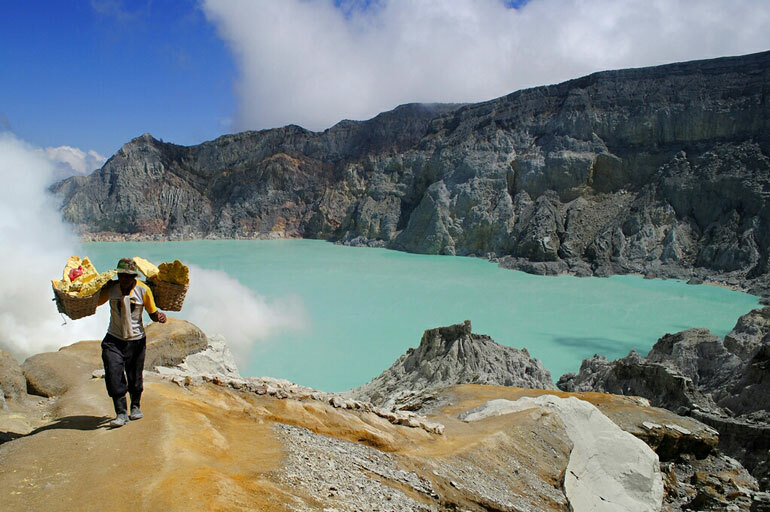 Community and visitors / tourists should not operate in a radius of 3 km northwest, 4 km south-west, 7 km south-south-east, distance of 6 km in the East-South-East sector, and at a distance of 4 km for the North-East sector of G. Sinabung. People living and settling near the rivers flowing from G. Sinabung must remain alert to the potential danger of lahars. The deposits formed a dam upstream on the Laborus River. People who live and move around the downstream watershed must maintain vigilance because these dams can be broken at any time. BPBDs Tanah Karo will immediately broadcast disaster / lahar / flood threat to people who live and move along and around the Laborus River. Source : Magma / Sadrah Peranginangin. The southern part of Peru belongs to the Central Volcanic Zone of the Andes, where there are 16 active and potentially active volcanoes. 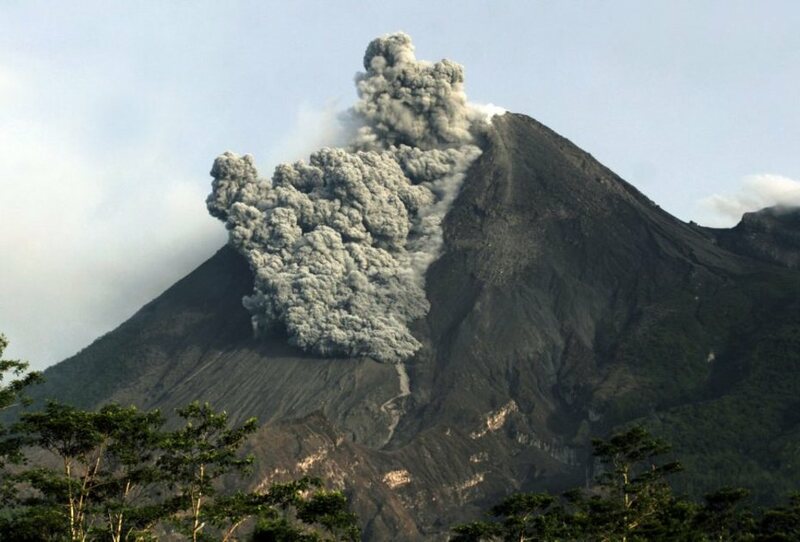 In recent decades, eruptive processes have been observed on Ubinas and Sabancaya volcanoes. However, 60 km north-east of the town of Moquegua is a volcanic giant whose last eruption dates back less than 400 years: the Ticsani volcano. This massif is considered a « high risk » active volcano because of the effect it could cause in the surrounding areas during an eruption. Previously (1999, 2005 and 2006), seismic activity and significant deformation had already been observed in the Ticsani volcano region. 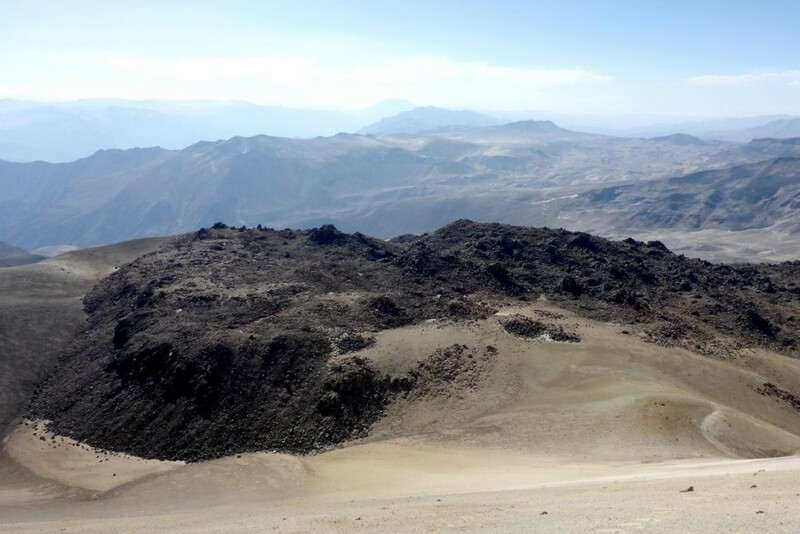 This is why the Geophysical Institute of Peru (IGP) has deployed a modern volcanic monitoring network in this region, acquiring information and analyzing data continuously since 2014. After the detailed study of the activity of this volcano, we ask ourselves: is the Ticsani close to the eruption? 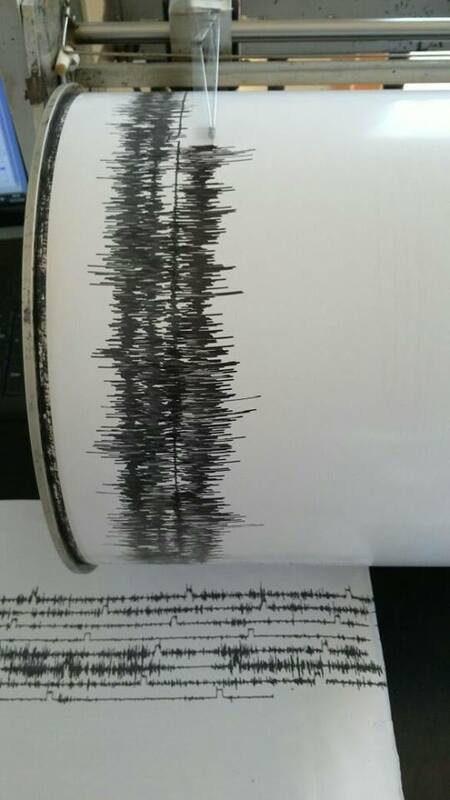 The results of the monitoring show that this region has significant seismic activity related to the influence of fluids from the depths. 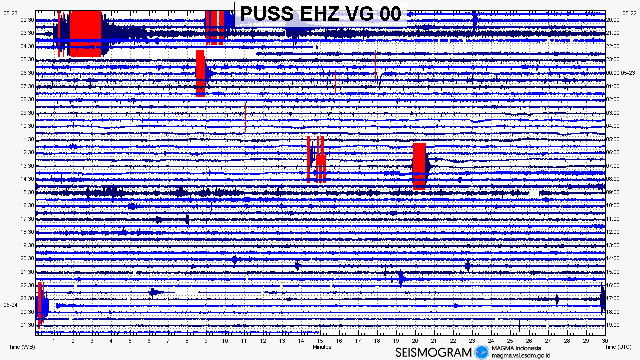 Dozens of earthquakes occur exceptionally for hours or sometimes days (seismic swarms) under the volcano. There are also earthquakes that indicate the transfer of magma between deep magma reservoirs. Added to this, low intensity thermal anomalies have been detected which have increased in temperature in recent years. 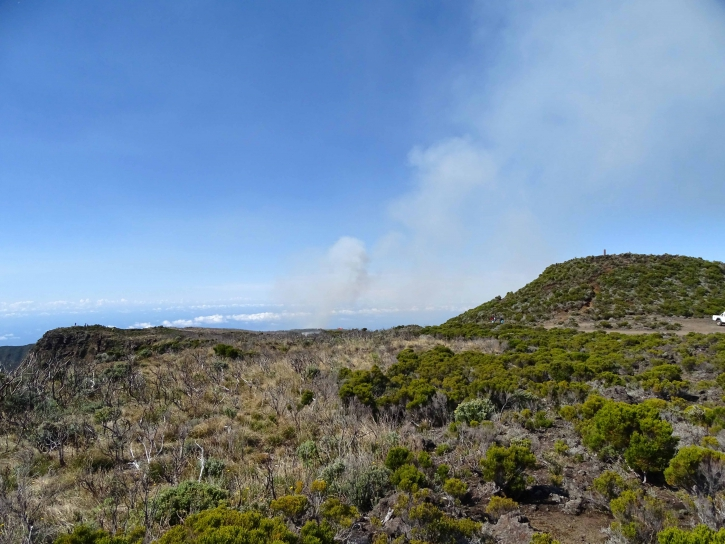 If an eruption begins, about 12,100 people will be threatened in the districts near this massif, such as San Cristóbal, Carumas and Cuchumbaya. Fortunately, the IGP has experienced eruptive processes on Ubiñas and Sabancaya and has perfected a prediction model based on the observation of eruptions and the different types of earthquakes occurring that form a sequence or a pattern. This prediction model can be applied to this volcano and other volcanoes in southern Peru. If there are obvious advances of the magma towards the surface that indicate the imminence of an eruption, the seismic network of Ticsani will constitute the first « line of defense », since it will allow the specialists to carry out the respective analyzes, to make a forecast and ultimately to launch a quick alert. The IGP conducts research and monitoring using information obtained through different survey methods (seismicity, soil deformation, temperature, gas and electrical signals), which generates bi-weekly activity reports and technical reports that reinforce the prevention mission. population. 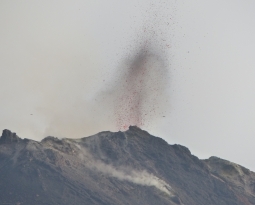 At IGP, we assume the commitment to monitor the behavior of this volcano 24 hours a day. The eruption started on April 27, 2018 at 23:50 local time continues. Following a sharp increase in intensity between 05h and 09h local time today, the tremor is stable again for several hours (values twice as high as those of the previous day (Figure 1). The flow activity always takes place mainly in lava tunnels. This morning some resurgences were visible at the foot of Piton Bert (Figure 2). These resurgences are at the origin of many fire starts at the foot of the rampart downstream of Piton Bert (Figure 3). – The surface flows estimated from the satellite data, via the MIROVA platform (University of Turin), recorded during the last 24 hours were between 1 and 2 m3 / s. The CO2 concentrations in the air at the summit, and the CO2 concentrations in the soil in the Plains region and at the volcano deposit level remain high. – The inflation (swelling) of the building seems to resume. This parameter will be confirmed in the coming days. 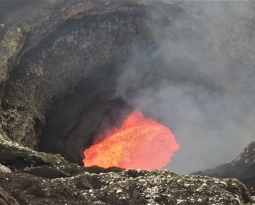 – No volcano-tectonic earthquake has been recorded during the last 24 hours under the Piton de la Fournaise building. 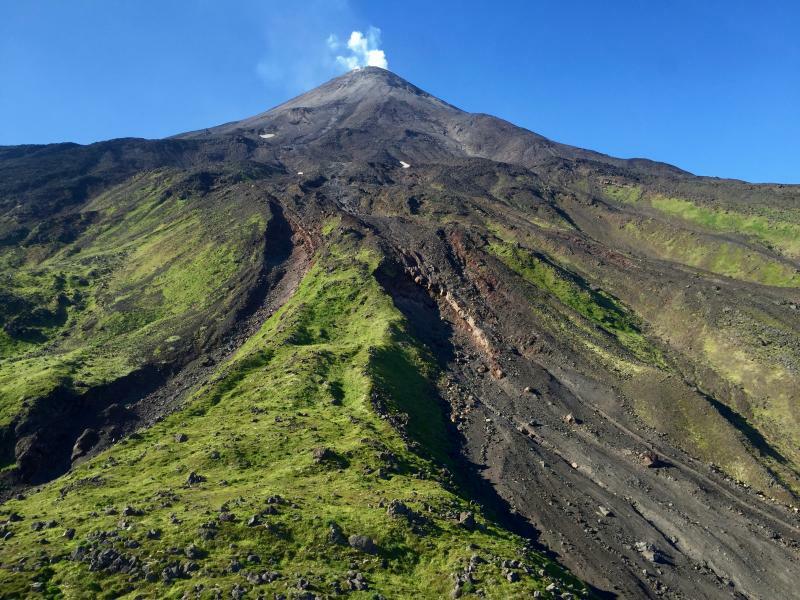 Low-level unrest continues at Cleveland volcano. Moderately elevated surface temperatures consistent with an open degassing vent were observed in multiple satellite images from the past day. Data streams from the seismic and pressure sensor stations on Cleveland stopped being received at AVO a little after 2:00 PM yesterday afternoon. Efforts are ongoing to restore the network. A large explosion from Cleveland, should it occur, would be detected on other pressure sensor and seismic networks in the region.